* 기존 통관불가 성분인 시트룰린을 제외한 아르기닌이 함유되어 새롭게 출시된 싸이베이션 본사 정품입니다. o 단백질 합성, 크레아틴 생성, ATP를 생산하는 데 필요한 아미노산인 아르기닌이 함유된 BCAAs 입니다. o 글루타민, 아르기닌, 오르니틴이 함께 설계된 L-Leucine, L-Isoleucine, L-Valine 2 : 1 : 1 비율의 BCAAs 7g을 함유하고 있습니다. o 운동선수, 보디빌더, 챔피언 파워 리프트, 웨이트 트레이닝을 즐기는 모든 분들에게 사랑받는 BCAAs 입니다. o 강도 높은 운동을 위한 최상의 BCAAs 입니다. o 비타민 B6 는 BCAA 의 빠른 흡수를 도와줍니다. * 이 내용은 FDA 에 의해 평가되지 않았습니다. 이 제품은 질병의 진단, 치료, 치료 또는 예방의 목적으로 사용되지 않습니다. o 운동 시엔 2스쿱을 잘 흔들어 섭취하세요. 운동이 없는 날엔 식사 사이에 섭취하세요. o 최상의 결과를 얻으려면 1일 2스쿱을 섭취하세요. o 건강한 만 18세 이상 성인만을 위한 제품입니다. o 임신이나 수유 중, 의사의 처방을 받은 경우 섭취하지 마세요. o 섭취 중 이상이 발견될 경우 섭취를 중지하세요. o 아이의 손이 닿지 않는 곳에 보관하세요. o 서늘하고 건조한 곳에 보관하세요. o 사이트의 모든 제품은 미국 현지에서 직배송 됩니다. 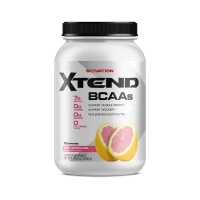 Scivation XTEND contains 7g of BCAAs ? in the naturedesigned and widely-researched 2:1:1 ratio - along with Glutamine, Ornithine HCl and Arginine Alpha-Ketoglutarate. 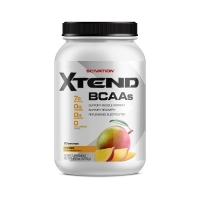 Plus, with a proprietary blend of hydration-promoting electrolytes, Scivation XTEND is the delicious, refreshing, sugar-free way to help anyone grind through a grueling gym session. 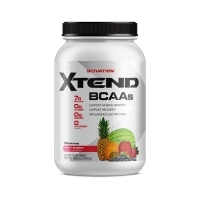 World-class athletes, elite bodybuilders, champion powerlifters, and weight-training enthusiasts of varying types use Scivation XTEND during their workouts in order to help them rain longer, harder, and with more intensity. Use Scivation XTEND to get the most out of your next workout. This product is only intended for healthy adults, 18 years of age or older. Do not use if pregnant or nursing. Consult with a licensed, qualified healthcare professional before taking this or any other dietary supplement product. Discontinue use 2 weeks prior to surgery. Immediately discontinue use and contact your healthcare professional if you experience any adverse reaction to this product. Use only as directed. Do not use if safety seal is broken or missing. Store in a cool, dry place. KEEP OUT OF REACH OF CHILDREN. This product is sold by weight, not volume. Some settling of powder may occur during shipping and handling, which may affect density of powder. This product contains the servings indicated when measured exactly by weight. As a dietary supplement, mix one scoop per 8-16 fl. oz. of water (adjust for taste preferences). Shake well and consume up to two scoops during exercise on training days or between meals on non-training days. For best results, use two scoops per day. Citric Acid, Malic Acid, Natural Flavor, Sucralose, Acesulfame Potassium, FD&C Red #40, FD&C Blue #1. * Percent Daily Values (%DV) are based on a 2,000 calorie diet. ** Daily Value not established.